2017년 7월 창단된 레오니아 영 챔버 오케스트라 (LYCO)는 음악을 사랑하는 열정과 재능을 가진 10~20대의 학생들로 구성된 오케스트라입니다. 다양한 연주 프로그램과 활동을 통하여 주님께서 주신 음악적 재능을 발전시킴과 동시에 복음의 씨앗을 심는 SEEDMISSION을 통해 아이들이 참된 크리스찬으로 성장하여 나갈 수 있도록 비젼을 심어주고 있습니다. 매주 주일 2시간씩 클래식, 팝, 성가, 재즈 등 다양한 레파토리의 연습을 하고 있습니다. 정기적인 연주로는 매달 교회의 첫 주에 성가대와 함께 오케스트라 연주로예배를 섬기고 있으며, 매년 2회 부활절칸타타와 크리스마스 칸타타에 참여 하고 있습니다. 매 해 테마가 있는 음악회를 통해 이웃주민들을 초청하여 교회와 거리에서 음악회를 가지고 있습니다. 현재는 10명의 챔버(플룻2/클라리넷/바이올린/비올라/첼로/퍼커션) 앙상블로 구성되어 있으며 매해 지원자 모집을 통해 규모를 키워나가고 있습니다. 악기를 2년 이상 배운 10-20대 학생이라면 누구나 참여 할 수 있습니다. 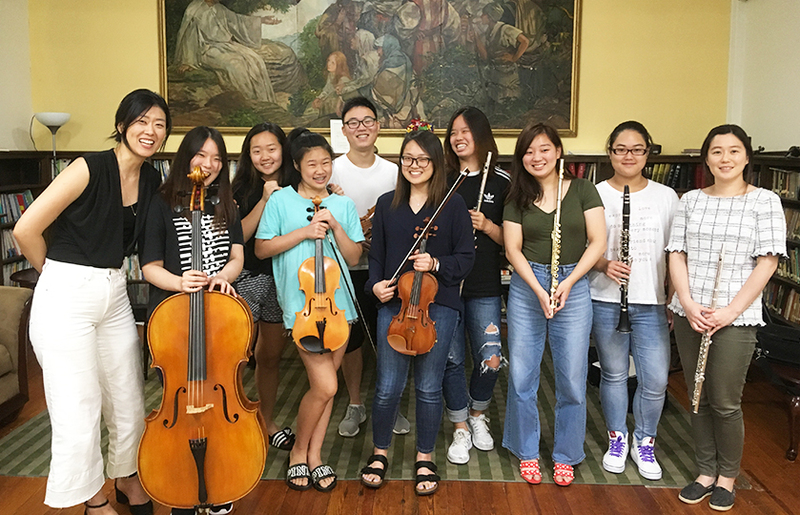 Leonia Young Chamber Orchestra, LYCO, was founded in July 2017. Our members range from teenagers to young adults who are talented and passionate about music. The orchestra gives an opportunity to develop their musical talent through unique concert programs and events. We spread the gospel through SEED MISSION, which is a concert specially designed for the people of the community. LYCO practices every Sunday afternoon for two hours. Our repertoire consists of pop, jazz, film music, and classical songs, as well as worship songs. The orchestra serves with the church choir every first Sunday of the month. They performed a beautiful Christmas cantata in 2017 and an Easter cantata in 2018. The orchestra performed at Carnegie Hall for the Global Choir Concert hosted by CNSN Broadcasting Companies. Every year, we have two cantatas for Easter and Christmas and an annual concert for the neighbors of the community. Currently, the orchestra consists of a chamber ensemble — flutes, clarinets, strings, and percussion. We are looking for more players to join us with an audition. Musicians in their teens and 20s that have played any instrument for more than two years are encouraged to apply. We are currently looking for woodwinds, brass, string, and percussion players.